GLENN ANGERS is an estate planning attorney serving clients throughout the East Bay and the larger San Francisco Bay area. He counsels clients in strategies for avoiding probate, minimizing taxes, maximizing retirement benefits, protecting assets, and creating and transferring wealth through the use of revocable living trusts, irrevocable trusts, intra-family gifts, multi-generational “dynasty” trusts and charitable giving. His practice also includes probate and trust administration. Good estate planning is about protecting your family and protecting your assets. Only then will you have the peace of mind that is so essential to living well. Each client will be provided with a plan to avoid probate, and individualized strategies to reduce or eliminate death taxes, and techniques for protecting your children from losing an inheritance in a divorce. All important goals, and all achievable. Then each client is reminded to always. . .remember. . .Rule 1. What is Rule 1? To live well! This means to enjoy yourself, celebrate your family, educate your children, engage in your community, travel the world, focus on what matters to you, whatever that is, but LIVE WELL! Keeping that one rule in mind will help you focus your thinking, complete your planning and move on to living. Glenn Angers earned his Bachelor of Arts degree in Journalism in 1978 and worked as a news reporter and feature writer for a daily newspaper and a regional magazine. He received his Juris Doctorate in 1985, and has studied gift and estate taxation law at Golden Gate University in San Francisco. Angers worked as a journalist, a teacher and a businessman before earning a law degree in 1985. He began his private law practice in 1986 in New Orleans, litigating in federal, state and bankruptcy courts. His practice focused on business and banking litigation, including representation of the Federal Savings and Loan Insurance Company (FSLIC) against the directors and officers of a failed savings and loan, estate planning and bankruptcy. In 1989, Angers moved to San Francisco (one day before the 89’ earthquake!) and began his California law practice. Since 1997, Angers has practiced exclusively in estate planning, estate and gift tax planning, charitable giving, probate and estate administration, and helping families avoid the financial and psychological damage caused by litigation. Angers is a member of the Trusts and Estates Sections of the State Bar of California and the Contra Costa Bar Association. He served for two years on the Board of Directors of the Diablo Valley Estate Planning Council. 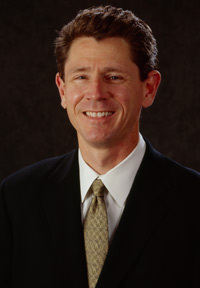 He is also a member of Wealth Counsel, a nationwide collaboration of estate planning attorneys. Angers is a lecturer for community and professional groups on issues relating to estate planning. Angers is a firm believer in Rule 1, which he most frequently practices by traveling, preferably with his wife and son, and as often as possible, to exotic places. In his office are close-up photographs of African elephants, one of which became agitated at just how close the amateur photographer was standing to the tusked mastodon. This led the angry elephant to trumpet his displeasure (an unforgettable sound), to stomp the earth (an unforgettable rumble), to flare his ears (an unforgettable sight), and to begin a mock charge (an unforgettable moment). Angers survived that incident, barely, which led to his development of Rule 1, and also to the purchase of a telephoto camera.